Rakkestad is a municipality in the county of Østfold, Norway. It is divided into the parishes Rakkestad, Degernes and Os. 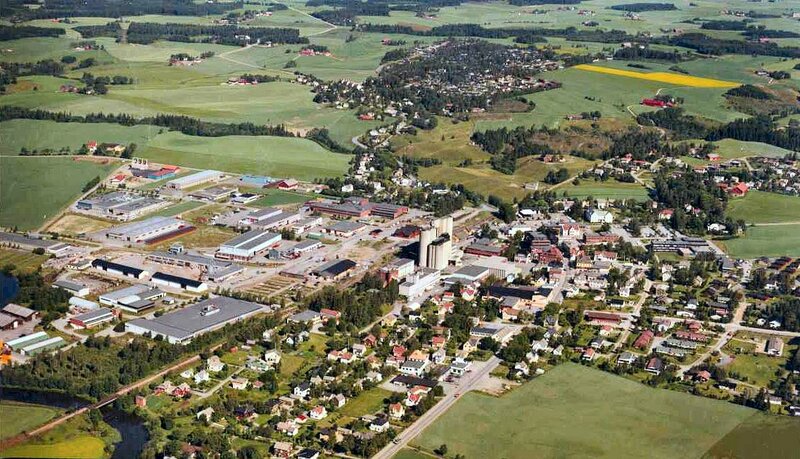 It is the county's second largest municipality by area and one of Norway's largest agricultural areas. Farming and forestry have always been important for settling and employment in Rakkestad. As a consequence the principal industries are grain growing, cattle - and dairy farming. Rakkestad has also developed a diversified economy based on agriculture and forestry such as poultry slaughterhouse and egg packing station, grain silo and mill, woodworking factories and agricultural machinery retailers. Traditional mechanical industry has developed into advanced technical industry directed towards the process -, maritime - and offshore industry. Rakkestad’s large areas of rolling, wooded hills offer excellent year round recreational and leisure opportunities. There are marked forest paths for hiking and cross-country skiing. Rakkestad municipality offers small game hunting as well as roe deer hunting in the municipal forests, which cover about 18 square kilometres. There are possibilities for farm lodging as well as cabin lodging. Landowners, angling clubs and others put much work into cultivating waters and lakes to ensure good fishing. Most lakes are limed each year, with support from the government. Fry fish and fingerlings are also re-stocked annually. Where the cultivation is carried out with governmental funding, the fishing shall be available for all, either by free fishing or through open information about fishing licence and opportunities. In Rakkestad more than 20 species of freshwater fish are registered. Many of these species lives in the Rakkestad River. The river meanders its way along, mainly through farmland, providing excellent river fishing for pike, roach and perch. Rakkestad is bordered to the west by River Glomma, Norway’s largest river. At Suteren in Os there is an outdoor recreation area equipped with toilet, open shelters and areas for making a campfire. You can fish for 26 different species from a small jetty or from land along the river. Fishing licence for the area can be obtained from self-service boxes along the river. In the Rakkestad Hills a number of small lakes offer the angler to fish in sheltered solitude. Although the pursuit of the large trout draws a number of anglers to the lakes, you will only occasionally happen to meet fellow anglers. Most lakes can be reached by a short walk from the car. Some of the forest roads are private and one has to pay a small fee in a self-service box, normally about NOK 20, -. Fishing licences can be obtained in the same place. Normal price for the fishing licence is about NOK 40, - for 24 hours, or NOK 200, - a year. Everyone in Norway has a right of access to and passage through uncultivated land in the countryside, regardless of who owns it. On uncultivated land, you may go anywhere you like on foot or on skis and picnic wherever you want. You may also put up a tent for the night, but you must keep at least 150 m away from the nearest house or cabin. If you want to stay for more than two nights in the same place, you must ask the landowner's permission. In the mountains or other remote areas you need no permission to camp. (325 m) it overlooks the whole county, parts of neighbouring counties and parts of Sweden. Linnekleppen is the only fire tower still in use in Norway. Rudskogen Motorsenter is the oldest asphalt racing ground in Norway opened in 1990. In 2006 the government decided to make Rudskogen Motorsenter the main centre for automobile and motorcycle sport. The aim is to develop the centre to be a flexible facility where capacity can be increased and several different activities can be conducted simultaneously. In co-operation with Borg MC, Sarpsborg and Rakkestad municipalities Rudskogen Motorsenter will offer an environment for almost every series in automobile and motorcycle sport.